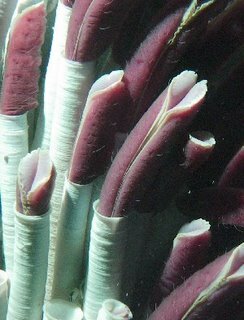 Deep sea mining worms to extract mineral wealth from the sea bottom? This science-fictional suggestion has been made (perhaps a bit tongue-in-cheek) by Greg Baiden, who holds the Canadian Research Chair in Robotics and Automation at Canada's Laurentian University. The mining industry is in need of radical suggestions and far-out ideas. Centuries of exploration have found most of the mineral deposits that are close to the surface; when mines get deeper, expenses climb exponentially. For a half-century, there have been no significant improvements in either the methods or the efficiency of standard mining techniques. Cue the imaginative thinkers, who have noted that there are animals in the ocean depths able to withstand extremely high temperatures and sulfur levels and whose host bacteria turn carbon molecules and nutrients into organic matter. The ocean depths also contain (largely) untapped mineral resources. "Mostly, everybody is just dipping their toe in the water these days in terms of innovation," Greg Baiden. "I believe the next breakthrough is going to come when people actually go to mine underwater and bring back a few of these animals and we start putting them to work in our processing plants on the surface," said Baiden. Although this is imaginative thinking, it is not original thinking. In his 1968 story A Gift From Earth, Larry Niven wrote about mining worms. As far as I know, the earliest reference to the general idea of a mining worm is from Love Among The Robots, a 1946 story by Emmett McDowell (see the entry for robot mining worm).